Gros grand. M.782. King seated holding sword and orb/Cross, crosslets. 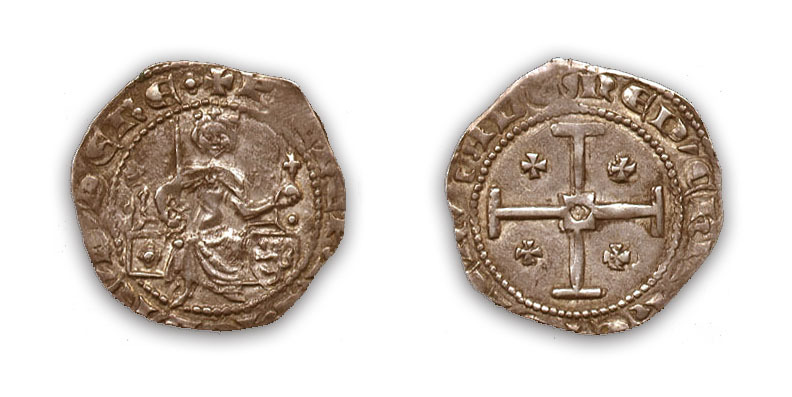 Pierre founded the chivalric Order of the Sword, symbolized on his coinage by the sword the king is holding (as opposed to a sceptre on other kings' issues). Medieval Argent 20, 1.9 gr., Half Gros, aVF, scarce. 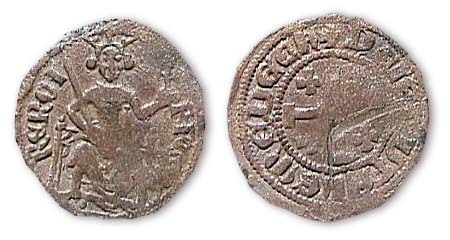 Pierre I de Lusignan (1358 - 1369 AD) Nicosia mint. Obverse : King seated on throne with bird perched on right side holding sword in his right hand and globus cruisinger in his left hand. On his left is the shield with the Lusignan coat of arms with the inscription : "PIERE PAR LA GRACE DE DIE ROI ". Reverse : Cross of Jerusalem with the inscription "DE IERVSALEM DE ChIPRE"